Hello all and thank you so much for joining us for the Hero Arts 2016 Catalog Blog Hop! Hero Arts always comes up with the most fun and adorable color layering stamp sets (if you are not familiar with Color Layering, please take a look here). The new Color Layering Gold Fish from the 2016 Catalog is no exception and is a super fun set to play with. 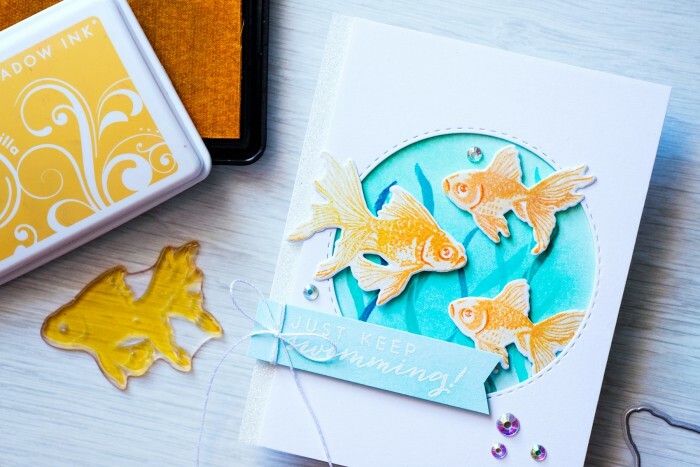 It lets you easily create beautiful dimensional-looking fish and with a little bit of heat embossing you can make your “fishies” sparkle and shine like a real wet gold fish! I don’t have the same colors and the same heart die that I used to create my original card (I am in Ukraine at the moment and my supplies are somewhat limited), but I really wanted to do a video for that project so I used similar products. 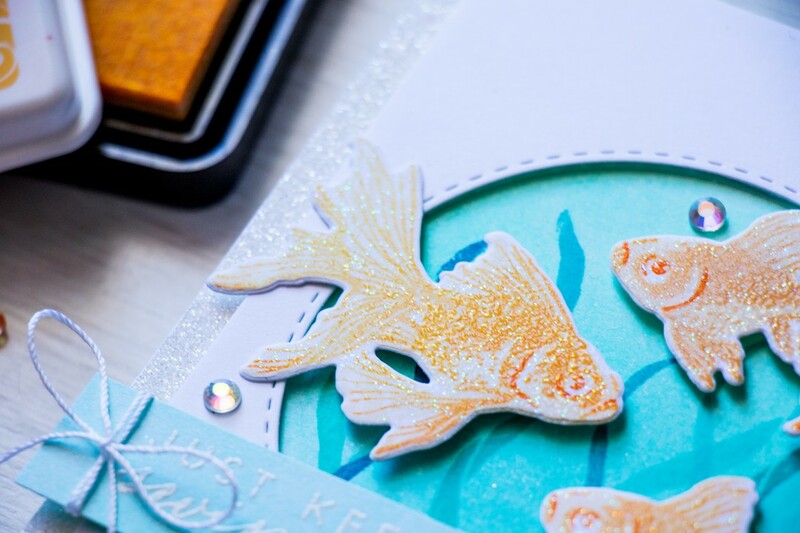 I used 3 colors of ink to stamp my Gold Fish – Butter Bar, Dark Quartz and Pale Tomato for the original card and Soft Vanilla and Butter Bar to Orange Soda Ombre for the card I’m sharing on my video. I also did a few additional test impression using various yellow, orange and red inks just to see what color combos I like best (I’m sharing a closer loot at the in my video). While I only tried stamping fish using yellows and oranges it can also be stamped using other colors; think about tropical fish (here’s a fun link on Pinterest to explore) and all the fun and vibrant color combos – pinks and blues, greens and purples. There are lots of options. I liked the idea of having my fish swim in water so I created a little aquarium for them using ink blending. The idea is to die cut a window in a panel and blend the blue and green inks onto another piece of paper to go behind that panel to look like water. I also used various seaweed images to fill in the background and make my water look more realistic. I used the same colors of ink for stamping seaweed and for blending the background. Some stamped images were stamped using lighter colors and some using darker making it look like they are located further away. A card like this can also be turned into a shaker by simply adding a layer of clear acetate and some sequins and beads. To make the fish appear like a real gold fish and also to make it appear wet and shiny I used Hero Arts Sparkle Embossing Powder. I usually like to use it for snow (on Holiday cards) or sugar (on fruits cards), but it works great for this as well. I only added one layer of this powder to my fish, but you can add more if you like. Here’s a close up of my heat embossed fish, I just love that sparkle! I’m also sharing a video tutorial today showing how to create this card! You can watch it at the top of this post or on my Youtube channel. If you like it, I would appreciate you giving it a thumbs up and sharing. Thank you! Lucy Abrams – your next stop! Hero Arts is giving away four $25 shopping sprees, drawn from comments left across all blogs in the hop. Comment by 11:59pm PT on Sunday, February 14, and Hero Arts will announce the winners on the Hero Arts blog the following week. Hop along and comment for more chances to win! Love the sparkle on the gold fish! I love your card. 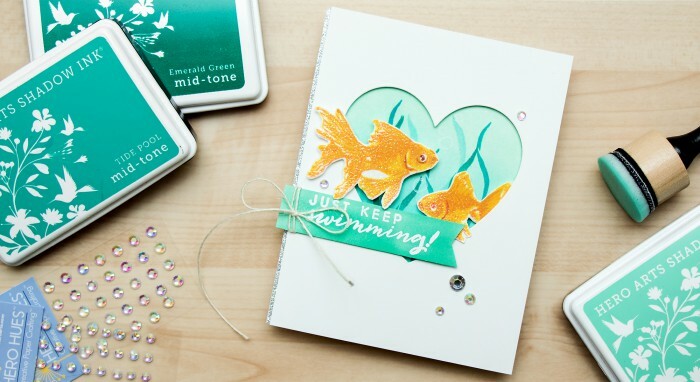 Those color layering goldfish are really neat and your layer of sparkle embossing powder is gorgeous! Thank you for sharing. The fish is really cute. Love the sparkly powder you used on the fishes. I am still struggling with color layering but this stamp set is another way to practice color layering. Those fish look so realistic! Cute cards! Fantastic card! I love the layering and fun colors. Thanks for sharing. Love your cute goldfish–absolutely adorable! Love your creativity. Thank you. Goldfish card is amazing! Thank you. Love that card. Thank you. I love your card .thank you for all the great tips. They do look wet! Fabulous! Great color combo and as many have said…the fish are perfect. Love that goldfish card! Thank you. Just beautiful! Colors, sparkle, stamps – great. Awesome cards and new release! Lovin’ it! Thanks for the chance to win!! 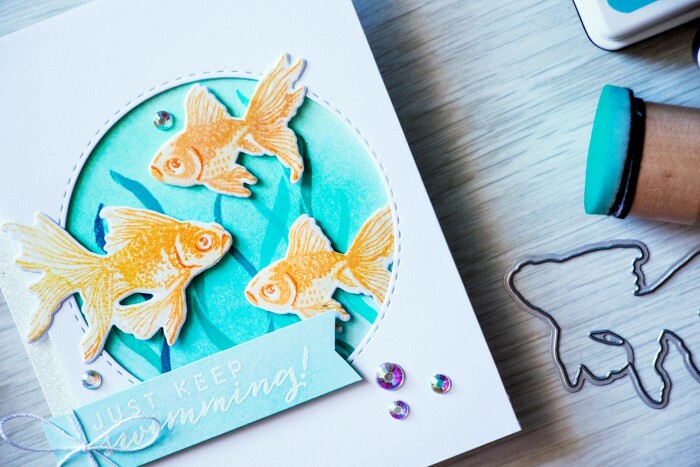 Love the cute fish stamp & die set and the card design you created! Ooh, love the sparkling fish. They are on my wish list. Thanks for video. Hana, what a gorgeous idea! Such a fun card and this really does give the look of beautiful coloring. They look so real, Yana! Great video and release, thanks! 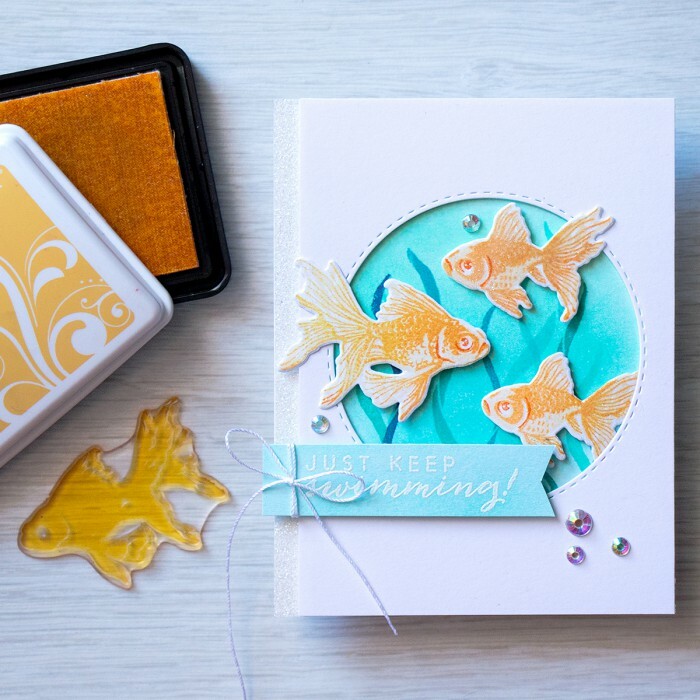 I love that goldfish stamp! Layering with the circle die was so clever. Great card and wonderful video. Thank you for sharing. I LOVE goldfish!! You did a great job with this card!! Gorgeous card Yana! Love the sparkle on the fish. What a cute card! I especially like the heart card. Thanks for the great card idea! I’ve already ordered this stamp set! Now I have to order the die set! You totally nailed the color/wet effect on those fabulous fish images! Gorgeous card! Love how bold the yellow goldfish are against the aqua background. Like the coloring on the Goldfish. Like the fishbowl look. Have a BEE-utiful day! Wow!!! Love your card!!! The sparkly fish were perfect in the bowl. Thanks! I must admit if it is embossed I want to make it. Wonderful idea to stamp the second layer first! Thank you for the tip! Quirky and fun. Thank you. I love these fish! Your coloring tips, layering and others were great. Thanks for sharing. Great card! Love how you did the fish. Really cute. Great aquarium idea and the sparkle for the fish! These fishies are stunning and so realistic! Fantastic cards! Love color schemes. Clean, fresh and crisp! Such a fun and gorgeous card!! Love the sentiment!! Thanks for the tip on how to make the fish look wet. Also, your tip about stamp layering starting with the 2nd layer, might help me because I have trouble lining up the next layer. So many beautiful cards! Thanks for the inspiration and for sharing your talent!